Ah, yes. When you rewind back time to those particular days that you did something rather odd:something you only come to realise now, a decade later and once you meditate upon it, you realise it makes perfect sense. It was something that shaped you to be who you are today. You try and deny it and just say ‘whatever ‘ ,but deep down you know it is the truth without any benefits of doubt.That single thing that happened in that particular day. Damn, why did I take so long to realise that. Or why did I just ignore it and ‘moved on ‘ instead of embracing it. Now let me take you through the events of that particular day. Well, like eight years ago, way back in 2008, I was somewhere in primary school in the suburbs of Mtwapa,that ‘famous ‘ coastal town. Don’t act like you don’t know it. It was around 2Pm and the classroom was steaming hot from the January heat. With small windows on each side of the classroom letting in small amount of that soothing ocean breeze, sleep was inevitable. On that day, fortunate for us, the teacher who was to come for Kiswahili lesson, a Mr John Omula :one tall black stone-faced man with pimples all over his face. We dreaded him like a plague. And to make matters worse, he was fond of giving us lots of homework, I mean lots of it, and the next day coming to punish us for each question missed. Today was another one of those days where you get thorough and merciless beating. But we were serving a living God. For some reason, the class prefect, with the proud task of being ‘responsible’ roaming in his veins, he had gone to’ summon the witch ‘ to ‘cast a spell ‘ on us :really heavy spells with his long thick bundles of wands, only to come back and report to us that he would not come for the lesson due to unavoidable circumstances, or whatever it was. We were just happy. Today we would go home with our body parts intact without any malfunction or abnormality whatsoever. That feeling of hope ,relaxation filled us all. Now all that was left was to find a way to pass time. Story telling ,which was mistaken by teachers for noise making, was one of them. We each began sharing our stories, most of which were stupid, but no one cared. The aim was to skillfully ‘waste’ time till the bell rings for heading home. It was now 3Pm. Stories were told during that half hour period. We laughed till we were exhausted.Now there was only one thing remaining. Our favourite at that particular time. How I wish we would have started with that one. Which one? You ask. Well, sleeping. An afternoon siesta in Mombasa. What more can you wish for. One by one, my fellow classmates went to slumber. Starting with the noisiest ones of course. Sleep called on to us like soothing jazz music. There was now silence in the classroom. Except the snorers. They sure know how to snore. I was still awake, seated at the back left corner of the classroom. I ran my eyes through the room. Heads were down facing the locker. I was left with no choice but to follow my peers. I placed my head down onto the locker in such a way that only my forehead was on my locker while my eyes, nose and mouth were facing the floor. I fidgeted my legs back and forth while observing them. Hopefully waiting for sleep to invade me. My deskmate was dead asleep and I had no one to talk to. I looked down the floor, and around me. Then my eyes spotted this orange-looking book. Hmm..I lazily stretch my leg towards it and pull it where my hands can reach. I grabbed it with my right hand . 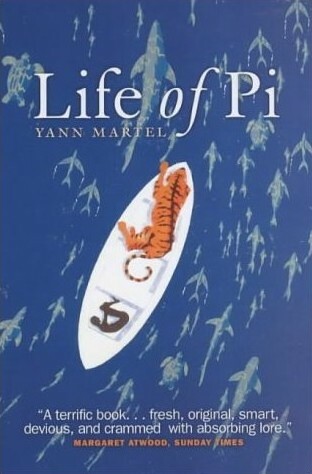 This orange book was titled ‘Life of Pi ‘. On the front cover was a young boy seated in the middle of a boat surrounded by the ocean, probably sea-locked. I looked closer at the picture and there were some wild animals with him in the same small boat. There was a zebra, a tiger, and some other animal that looked like a chimpanzee -ish. I flip the book and read the back cover preview. That short preview of the novel totally, I mean totally captured me. I felt as though I had read one of the most epic stories ever-just that short part. My mind was awaken. The description of the young boy stranded at sea with wild animals filled my mind. The thirst for wanting to know more gushed in me. I felt a certain feeling- trust me that has never happened before. My brain wandered away from my body and I could feel the burbling of the ocean waves hitting the boat in which the boy(whose name was Pi) was. In the cover photo he wore only a short. I imagined the cold he felt. Wow! The author of this novel must have been…well..a f****ng genius in his way. I was craving to place my eyes onto that masterpiece I had just realised. Immediately, placed the book on my locker and began reading from page one. I looked at the number of pages..1245 pages! . I began reading that novel. There and then, my love for novels was unfolding. The novel drifted me away from class into the ocean. It being set in an Indian environment, I felt my mind becoming familiar with the Indian culture -I felt Indian. I didn’t know how time passed till the bell rang. My classmates woke up from their sleep and took their bags as they went home. I hardly noticed their commotion as my mind was deep, deep into the novel’s world. Until a friend of mine bumped my shoulder telling me to stop reading and head home. I came back to my world(a cruel one) ,placed the book into my bag hoping no one would ask for it until I was done reading. I quickly rushed home with the fastest pace I could afford. I didn’t even greet anyone when I arrived home. I rushed straight into my room, took out the novel and started reading. It was like a drug. Anyways, that was my first novel, ever, to read,something of which I am proud of till date. Life of Pi. I may have forgotten the author but the book, one of a kind to me. I finished reading the novel the following week and I felt I had achieved something, however small it seemed. I realised the ‘sweetness’ of novels and since then, I have carried the enthusiasm with me and trust me, the creativity that comes with it is overwhelming. Oh, and by the way, they did a movie about it a few years ago and honestly, it’s just as great as the book itself.